It started with a chair. Not just any chair, you see. One of those old 50s era chairs like my MaMa kept in her kitchen. The one with the step-stool underneath where I could climb and help make the fried chicken even though I wasn’t even tall enough to see over the counter. A chair like that, from your memories – well, it calls to you. I found mine at the VintageCharlotte market one lazy summer afternoon. Its bright red finish, though drippy and chippy and messy, stood out against the sea of vintage goods and insisted that I take it home. And for $35? Done. Let’s just say that chair needed some love. At some point someone had tried to spruce it up, painting it that vibrant red, but well, they just didn’t take their time. If I was going to bring this chair new life, a good sanding was in order to remove all the dried drips and new fabric was needed to cover the old seat and back that had also been painted. I first set to work removing the chair back and seat so that I could properly recover them in new fabric. I loved the red color of the chair, so I picked a red and white chevron duck cloth – something sturdy that would hold up to a little foot traffic! I couldn’t remove the old fabric, so I just had to cover over what was there. It took a little bit of effort, some fabric glue and a flat head screwdriver, but it got the job done! The main body of the chair? Well, that had to be taken outside for a good old-fashioned sanding. I highly recommend foam sanding blocks for any project where you have to get into nooks and crannies! Also, be sure to wear a mask, even if you are outside. You don’t want to breathe in those particles! After sanding, all that was needed was a few even coats of a good spray paint. I used a quality spray paint in a cherry red color that was good for metal applications. 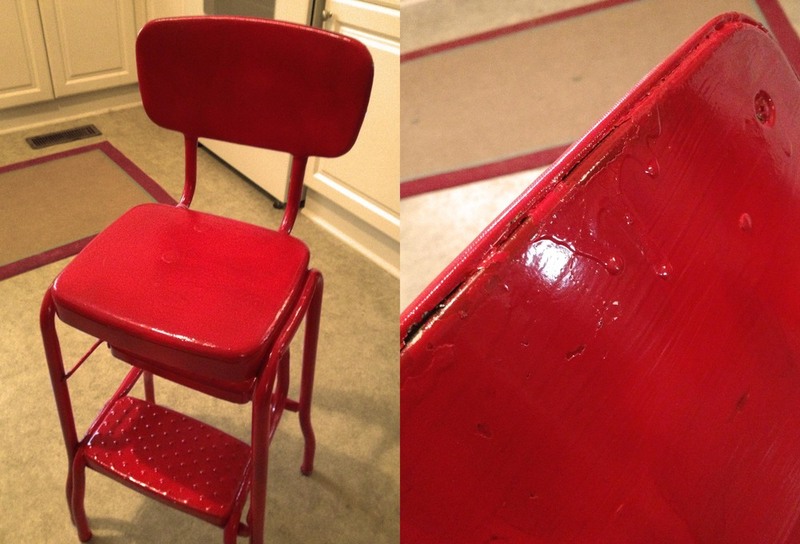 Since my chair was already the color that I wanted it to be, I only needed to use a few coats of the paint. If you are wanting to change the color of your project completely, make sure you prime it first! Once my chair was dry and my seat back and seat cushion were done, all that was left was to put it back together! I did have to make a trip to the hardware store, as a few of the old screws were stripped and would not go back in place. I simply took the old ones with me and compared them to what was available until I found one that fit! Taking in the old piece will also make it a lot easier for a store associate to help you, should you need it! I can’t wait for my MaMa to see my “new” chair!